They’ve shared bills and tours with bands like Sloan, Titus Andronicus, Tokyo Police Club, Single Mothers, and a million shows with band you’ve never heard of and probably will never hear of. In between sleeping on floors, eating cheap meals, and all the sludge work that comes with being in a touring band they caught the attention of SideOneDummy, who have released the bands self-titled debut album on exclusive license from Canada’s Royal Mountain Records. The album was recorded by legendary producer Dave Schiffman (Weezer, The Bronx, Vampire Weekend, Rage Against The Machine) and captures every ounce of blood, sweat, and tears and spins it into a must-hear album. The band has offered up a pair of music videos that perfectly encapsulate the excitement of their music. First off is “Lionheart.” Using a time-lapse technique, this stationary-shot video begins with the early stages of a basement party. Over the course of the song, which spans several hours of time-lapse, the party gets cranked up to a staggering level, with all the staples of a good time: beer hands, keg stands, make out sessions, and even a colorful display of fireworks to end the night. PUP is bringing the party to us in this clip! For the second video, “Reservoir,” we the viewer barely survive a night at a PUP live show. In fact, the band barely survives themselves. A string of freak accidents leaves the band bloody, bandaged and battered, with frontman Stefen Babcock even taking a shard of broken guitar through the back and directly into the heart. With teeth flying out, limbs being broken, and general chaos ensuing, it’d be foolish to think that there weren’t some injuries in the making of this video, no matter how scripted it may have been. But with the assist of the crowd the band continues on and finishes what they start; a blistering punk rock set. Then again, the video starts with a fan bringing in a defibrillator, so what did we really expect? 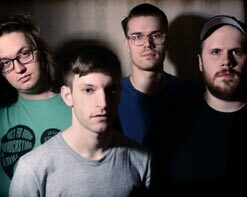 We’d love to tell you more about PUP and their upcoming US tour supporting The Menzingers, and get you out to meet the band. Please contact Andy Gesner and the HIP Video Promo crew at (732)-613-1779 or info@HIPVideoPromo.com . You can also visit www.PUPtheband.com and www.SideOneDummy.com for more info.